The San Francisco Museum of Modern Art has assigned Stamen with the task of developing an interface for exploring their collection of artworks. At the end of 2007, when the project went live, it consisted of 3500 artworks and has since then grown up to 6419 items. Stamen took a map-like approach, and even built the application on top of their Modest Maps framework. This explains, why the interface coped very well with the almost doubling of items since its introduction. The works of art are however not arranged according to their geographical origin, but in a two dimensional grid. It is not at first evident what the criterium for the particular ordering of the works is. After very close inspection it seems, that the date of acquisition is responsible for the composition. Not necessarily a very informative feature for users outside of SFMOMA. Navigating the collection also follows the map paradigm. The user is able to pan by dragging the canvas, and zoom by pressing buttons or double clicking in or outside the “lens”. The lens serves as a selection tool. It can be dragged and more detail is revealed about the artwork in its center. Inside the lens, the collection is zoomed in to the next zoom level and the size of the lens can be adjusted by dragging its edges. The interface also allows searching for title, artists, year or keywords. When a search is successful the first search result is selected. A number indicates the amount of results. It would be helpful to also see the results somehow emphasised within the map. By pressing arrows, the user can navigate to the next result. If several results have been found, the user is taken on a journey across the map, as it smoothly pans under the lens to the next piece of work. Unfortunately, the ordering of the works does not make this journey very meaningful. 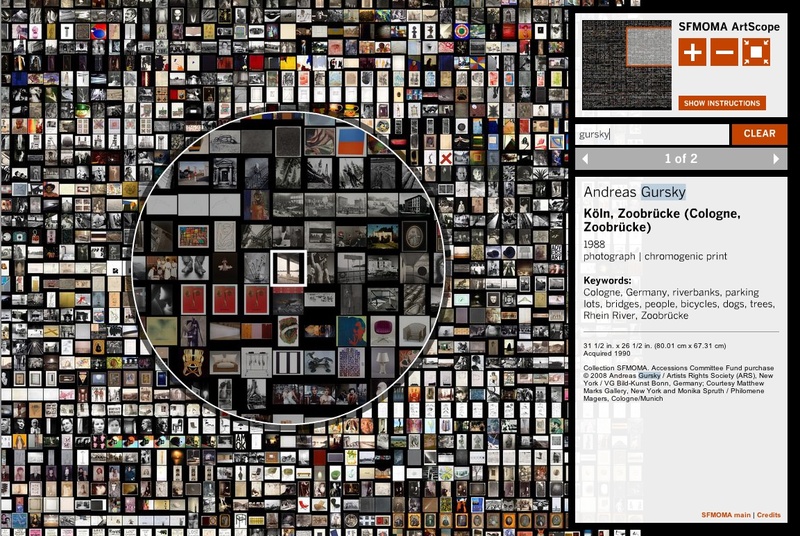 ArtScope is quite an attractive interface in its simplicity, and gives an impression of the size and content of SFMOMA’s collection. In this sense, it is more of a visualisation than a real exploration tool. Better search and filtering tools, as well as sorting options would greatly improve the overal use for the general public as well as curators.